I’m very concerned about the proposed cuts to Medicaid. I worry for myself, even though my health is pretty decent now, but what happens if it goes south? My kids can’t afford to take care of me. With the cuts to Medicaid and the changes to Medicare congress is talking about, it’s like they are changing the rules in the middle of the game, that’s how I feel. I’ve paid into these programs my whole life, so they would be here if I needed them, if my family needed them. That’s what I feel like is happening to the seniors, we’ve paid in our whole life and now you’re going to change the rules, it’s not fair. We’re at ages now where there aren’t a lot of options. Our housing costs are continuing rise, other costs are rising and income doesn’t. I’m still working part time now, but I’m facing a surgery in the next couple months, and I’m not going to go back to work afterwards. I’ve been taking care of relatives who are ill for years now. First it was my Aunt when she was ill. She had been my favorite Aunt when I was younger, but we’d fallen out of touch. One day I was driving by her house, and just had a feeling I needed to stop by, but I kept driving. I got that feeling a few more times, so I finally stopped by. I found out she was quite sick. Her husband was doing even worse. He had gotten to the point where he couldn’t stand or move around anymore, and she was no longer able to lift him. He qualified for Medicaid so we were able to move him to a nursing home. Together his pension, his vet pension, and Medicaid covered the nursing home costs, and left him with about $30/month to live on. My Aunt stayed home for quite a while, and I cared for her. For about ten years I took care of her, driving her to doctor’s appointments, taking care of their finances, helping out in whatever way she needed. Finally, she started falling and we had to move her to a nursing home too. When my Father died my Mother was left with no one to care for her and because I was self employed at the time I was able to arrange my schedule to make sure she got to doctors appointments and such. She had Alzheimer’s and eye issues and could no longer take care of herself. Now I care for my husband who is quite ill. He has health coverage through Medicare, and because he has a chronic condition, Medicaid covers anything beyond the Medicare coverage. Chronic condition costs add up fast, he’s been in the hospital a couple times and each time the average cost was $25,000 for a 2-3 day stay. I don’t know what we’d do without healthcare coverage, we’d be in trouble very quickly. Medicaid coverage is so important not just for emergency coverage he needs but also for help for me. He recently had a heart attack about a month before I’d planned to go on vacation with a good friend. We’d been planning the trip for two years, and I really needed the break. My husband was able to qualify for a home health aide to care for him for the couple weeks that I was gone, without that coverage, I would have had to cancel my trip. Canceling a trip may seem like a minor thing, but it is extremely stressful to be the sole care giver 24/7 when a loved one is chronically ill as my husband is, and I still work part time as well. Any 24/7 caregiver that has to do everything, shopping, house cleaning, yard work will tell you that. When you have that much stress you need to get away, it takes a big toll on you, and stress will kill you. It’s hard to maintain a perspective without losing your temper, or stopping yourself from getting depressed, because it can be depressing. The ability to get away for a short period of time was huge; it was needed and therapeutic for me. Knowing we have that coverage also gives me peace of mind as I plan for my own knee surgery. I will be unable to care for my husband and take care of the house while I’m recovering. Neighbors in our manufactured home community have offered to help look after him, but it is good to know that a home health aide is an option if we need it. 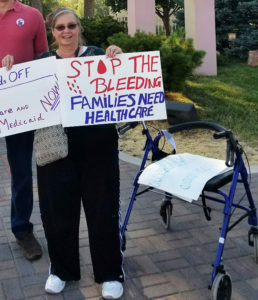 As much as I worry about what would happen to me and my husband in the long term if Medicaid is cut and we don’t have the assistance paying for a home health aide or nursing home as my uncle did, I’m more concerned about what will happen to my kids. My children are ranging from age 45-50. They’ve all been working since they were teenagers and they’re still paying into these programs. They’ve been working all these years and now you are going to change it? If congress restructures Medicare as the House Budget Commission is suggesting, it could eliminate the guaranteed coverage retirees have now. A voucher system is the first step towards privatizing Medicare, and we all know that if congress gives us a stipend to buy our own coverage, it won’t be as good as the coverage Medicare provides now. With Medicare you have a guarantee that is backed by the government; with private coverage you don’t have that guarantee. There is no reason for congress to change a program that works so well for millions of retirees, and it’s just not fair to change the rules on us like this.